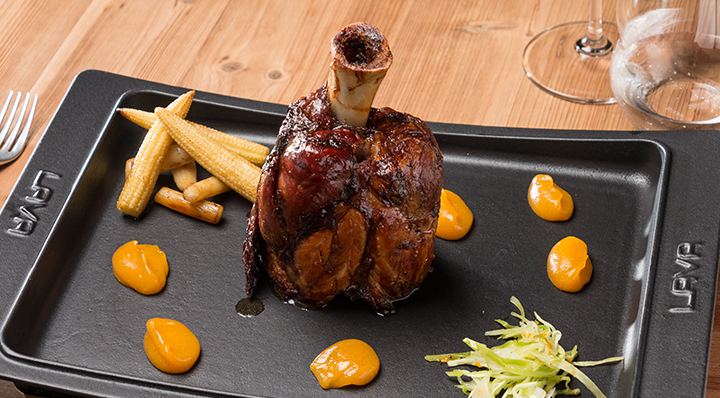 Serve pork knuckle with sautéed and caramelized mini corncobs and salsify. Marinate the pork knuckles for 3 hours, clean thoroughly and briefly sear on all sides in a pan. Allow to cool and then vacuum with 20 ml of pork broth and a nut-sized piece of butter. Cook for 24 hours at 64 °C in the water bath of the fusionchef sous vide cooker. Cool down in ice water and set aside. Heat for 10 minutes at 180 °C in the oven while basting with broth repeatedly. Cut the white cabbage into a fine julienne strips and place in a bowl. Add orange peel, lemon peel, ginger and lard, mix thoroughly and then vacuum. Cook for 20 minutes at 90 °C in the water bath of the fusionchef sous vide cooker. Cool down in ice water and set aside. Cook all ingredients over low heat for 30 minutes. Remove from heat and remove the vanilla bean. Stir in the rum. Mix in the Thermomix and strain through a fine sieve. This recipe was kindly provided by Diego Dato.